Unsurpassed drying performance and efficiency. Dupps Airless Dryer This innovative new design features superheated steam at atmospheric pressure as the drying medium. This Dupps Airless dryer is notable for dramatic reductions in air pollution and process odors with higher product quality. See More. Dupps Ring Dryer This flash dryer grinds, dries, conveys and produces heat ...all in one system that handles any material that can be entrained, but won't stick to duct work during drying. See More. Complete turnkey systems include everything your application requires -- burners, material feeding and conveying equipment, recycle air systems, high-efficiency particulate collectors, and state-of-the-art PLC controls. Download QuadPass brochure. Why the Dupps QuadPass Dryer is so much better than other drum dryers. Replace your old drum with a high-performance QuadPass drum. •	There is minimal risk of in-drum fires because of the oxygen- starved environment. •	It's an indirect heated dryer—the products of combustion are isolated from the process loop of the dryer. •	Minimal odor control equipment is needed. •	There is no visible plume of dryer exhaust. •	The dryer's exhaust is essentially water vapor, which can be condensed to recover thermal energy and used elsewhere in the plant. •	No pressure vessel is required because the dryer operates at atmospheric pressure. •	Exhaust volume is much less than comparable heated air dryers. So if an RTO is used, it will be considerably smaller, and less expensive. Because it exposes the material to heat for only a few seconds, the Ring Dryer gives you a cooler product, ready to bag or store, with accurate moisture content and no wet spots. And because it recirculates 50% of the heated drying air, you save on fuel costs. •	Product has light, uniform color. •	Available in an airless configuration. Ordinary three pass drums (upper diagram) can over-dry. Material starts drying at high air velocity then drops at each stage, so particles can accumulate, overheat and clog. 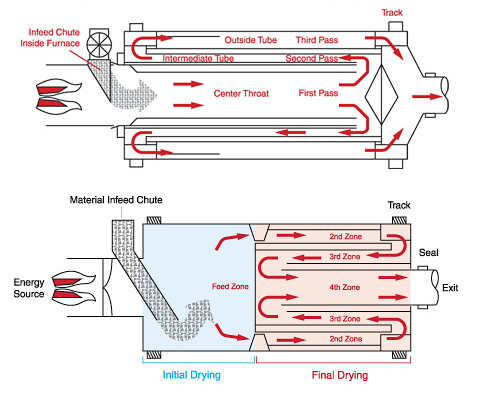 The QuadPass™ Four-Zone Rotary Drum Dryer (lower diagram) starts at the slowest velocity, then gets progressively faster. This dries each particle of material at its individual drying rate, regardless of size, density or moisture. Dried particles exit the drum without overheating or volatilizing. 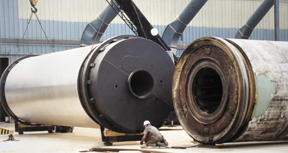 Your existing dryer with a QuadPass rotary drum can be your fastest and most economical way to improve product quality, increase production, and reduce emissions. If your current drums are broken, burned, worn out, or don't meet production quality or quantity, we can replace any size, make or model with a new state-of-the-art QuadPass drum using the same footprint.